Grass Corp., a pasture-based farm located in Perry County, Ind., is officially making bi-weekly deliveries locally with its first Owensboro pickup location at Gene’s Health Food. Customers are able to pre-order products directly from their farm with deliveries every other Monday at 4:30 p.m. But Grass Corp. has prided themselves on more than just the label of “grass fed.”“Our goal is to really take advantage of the pasture we have to raise the animals humanely and in the sunshine when possible. 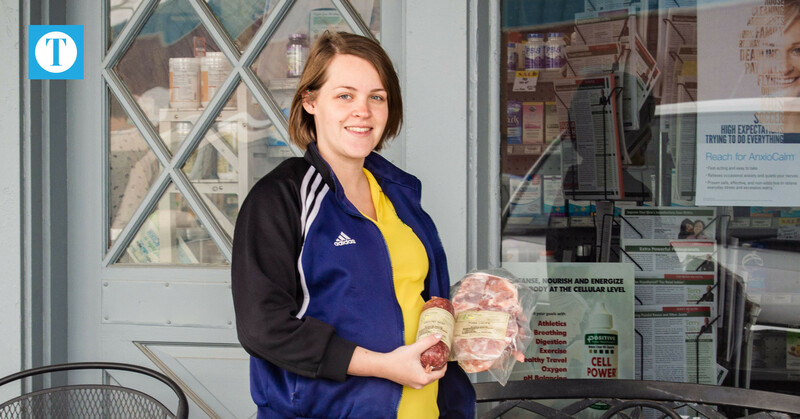 There really is a difference in the flavor and quality of the meat,” said Samantha Cavender, the daughter of owner/operators Stan and Martha Steckler.All of the Steckler’s eight children play an active role on the farm. Cavender, who moved to Owensboro to attend Brescia University, has since married and made Owensboro home and is hoping to continue to be involved in the family business. She oversees the farms marketing and public relations while exploring new avenues of growth such as the expansion of their Owensboro pickup location.“In 2005 our family actually moved from the Ferdinand area to Perry County,” Cavender said. “It was a big change for us in that it was another step away from a large commercial dairy operation to a small farm. In 2007, we sold our big dairy herd and have since moved to what we’re doing now, a wider product offering and able to sell directly to the customer.”All Grass Corp. meats are hormone and antibiotic free. The family utilizes holistic management to restore the soils under their care in an effort to grow high-quality pastures to nourish the many animals they are raising.“An animal that is raised on the pasture where they get sunshine and eating grass that they are intended to, they are healthier and really don’t need those antibiotics,” Cavender said. “If you go to Kroger or Walmart you’ll find things that are labeled as organic or grass fed on the label, but a lot of those cows are only actually on grass for part of their life so they are actually not 100 percent grass-fed oftentimes.”Cavender and her family believe in the differences seen in pasture-raised animals versus those raised in a commercial setting, stating their animals aren’t sick all of the time like they once saw in a commercially grown operation.“We started then with just a few cows and no more commercial dairy, but direct marketing to our customers now instead. That allowed us to incorporate pigs, sheep and poultry,” Cavender said. “The chickens do receive grain as they are chickens and are designed to, but they are raised on the pasture and they are moved every single day to fresh pasture as they are naturally homebodies.”Grass Corp. welcomes visitors to the farm for customers to see first hand how the animals are raised. To schedule a visit or to view all their product offerings, visit the Grass Corp. website. Turkeys clear a path for Elijah Steckler as he inspects the nearly 200 birds his family has raised on their farm between Branchville and Oriole. The pasture-fed turkeys were protected by an electrified mesh fence that was moved regularly to provide them fresh pasture. They also ate locally grown grains but were not given any hormones or antibiotics. It’s going to be a busy week at the Steckler Farm. Thanksgiving is fast approaching and there’s a flock of turkeys to prepare for holiday dinner tables around southern Indiana and even portions of Kentucky. Far removed from their cousins reared in large commercial poultry farms, the birds grown in this fertile area of northeastern Perry County are fat, sassy and living out in the open. Stan and Martha Steckler and their eight children have cared for the turkeys since they arrived in mid-summer as small yellow balls of fuzz. The birds are grown now, reared on pasture within the confines of a portable pen moved often to ensure they have fresh grass. Locally grown corn and soybeans, free of genetically modified organisms, added to their good nutrition. “They’ve grown well,” said Martha Steckler. The family also raises pastured beef, pork, lamb and broiler chickens. They also raise laying hens and dairy cattle. The Stecklers serve a growing component of the food market, livestock raised on local grass and grain and fed rations without antibiotics or hormones. They focus on soil fertility and healthy, sustainable farm practices. This is the fifth year the family raised turkeys. Some of the birds, which will be about 16 weeks old when ready for the table, were spoken for weeks ago. Others are still available through the family farm’s website. The couple delivers freshly dressed birds in the region, as far away as Evansville and Washington. “A lot of people are looking for a naturally raised turkey,” Stan added. Farms like the Stecklers’ give the public a choice between conventionally raised birds and those from smaller family farms. Perry County’s ag community is increasingly diverse with farms of various sizes producing corn, soybeans, wheat and other grains. With is rolling pastures and hayfields, the county is a leading beef producer in the state and while smaller in number, dairy and hog operations also thrive. Poultry buildings, many of them large rectangular structures holding thousands of birds, can also be found, including those built in the last few years. The Stecklers’ turkey operation is smaller in scale but more hands-on. The couple’s children helped care for the birds and the two youngest, Jeremiah and Elijah, walk amid the chatty birds, which seem more curious than alarmed when visitors approach. On Wednesday, the family will herd the turkeys a couple of hundred yards, where they will be humanely processed, dressed and prepared for delivery. Remaining birds will be kept refrigerated or frozen until delivered or picked up. The family sells its birds by the pound and while the turkeys will cost somewhat more than the frozen birds in supermarkets, Thanksgiving diners will know where their birds come from and how they were raised. More information on the turkeys can be found at www.grasscorp.net, by emailing the Stecklers at grasscorp@psci.net by calling them at (812) 843-3277. Experience the Steckler's way of life as they put a new spin on the old-fashioned values of a traditional farming family. 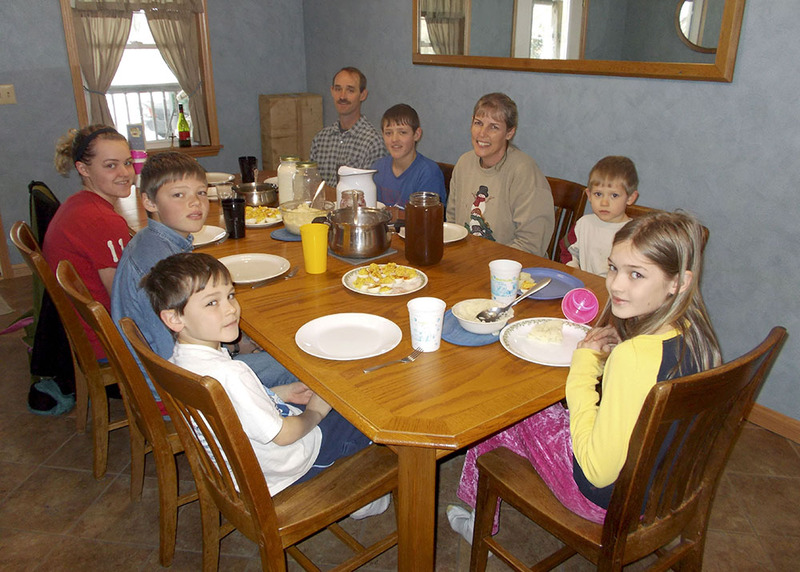 Stan Stecker, 42, Blake Stecker, 14, Martha Steckler, 46, Jeremiah Stecker, 3, Danielle Steckler, 10, Eli Stecker, 7, Joel Stecker, 12, and Samantha Steckler, 16, sit down for a home-grown lunch at the family table. The main dish: rabbit gravy. /Photo by Brittany McNeelan. Martha Steckler stands at the island in the middle of her kitchen putting the finishing touches on the mashed potatoes, while her youngest son, 3-year old Jeremiah, stands on a chair to her right so he can lick the masher she used for the deviled eggs. She asks 7-year-old Eli to set the long brown table with an extra place for me. "If you don't like it, we won't hold it against you," Martha tells me, "and if you do, you're welcome to more." Six boys and girls take their seats around the table, leaving two chairs unfilled. One is reserved for 18-year-old Garth, who's had a little car trouble, and the other is for 19-year-old Gavin, who's training to be a priest. The family bows their heads and recites the Lord's Prayer, the Hail Mary and the traditional prayer before meals. Once they finish, Stan asks Martha, "Is that what I think it is?" nodding his head toward the main dish. Martha shakes her head yes and replies nonchalantly, "Rabbit." Stan looks at me and tries not to laugh as he explains that the meat perched on top of my mashed potatoes is a rabbit that had been raised by their 14-year-old son Blake. Like most of the family's meals, all the food we're eating was grown here on the farm, including the cabbage in the homemade sauerkraut and the beets used to flavor it. The deviled eggs came from their hens and the green beans and onions from their garden. The green beans haven't made it to my end of the table, though, and when I ask Danielle to pass them, Martha jokingly tells me I'll have to scoop them off someone else's plate. "With as many hands and mouths as we have here, you have to get in there and grab what you want," Stan says. The Stecklers are one of a growing number of farm families in Indiana who are converting from traditional to organic practices. Lt. Gov. Sue Ellspermann believes the switch to sustainable agriculture is important to Indiana's future. "Stan and Martha are true entrepreneurs, stewards of the environment, and a great Hoosier family," says Ellspermann, who worked alongside the Stecklers and others to draft legislation allowing the sale of poultry at farmers' markets. The number of organic farms in Indiana has jumped in the past 10 years to 180 operations that cover more than 18,000 square miles of land. Indiana is still catching up to Ohio, with 50,000 acres, and Illinois with 30,000 acres. The southern third of the state is home to 26 organic farms priding themselves on operating without using any harmful chemicals, antibiotics or growth hormones. The family of 10 works together to be as self-sufficient as possible by providing their own milk, eggs, produce and meat. They use their diversified, 100-acre farm to make a living and feed the family. Though Stan is a second-generation farmer, his organic operation is a lot different from the traditional farm his father ran. His father wasn't always comfortable with the transition, but he's come around as he's seen his son's family flourish. big enough to be productive, and they did. His early work on the farm prepared him to run his own operation. On the Steckler farm, everyone has chores, and Martha and the kids roll out of bed about an hour after Stan. Samantha and Danielle make breakfast and get food set up for the rest of the day by baking fresh bread and brewing Kombucha, a fermented Russian tea said to be a health tonic. The boys grudgingly head outside to begin feeding and watering the cows, pigs, chickens, lambs and goats. They also have to feed their two dogs, Pup, a giant Anatolian shepherd with the mane of a lion and a roar to match, and a little brown mutt named Mikey. "Chores usually aren't that bad," says 14-year-old Blake. "It just has to be done," agrees Joel, 12. All the kids admit that while sometimes they'd rather be doing other stuff, their chores come first. And when it comes to feeding and watering the animals, it's a life-or-death situation. They shoot to finish with morning chores by 8 a.m. Then they head into the house and wash up for breakfast. The kids work together to wash and put away the dishes and sweep the floor. Then it's off to their bedrooms for school, which for 7-year-old Eli includes a mid-morning break to gather the day's first round of fresh eggs. In 1996, after adding their third child, Samantha, to the family, Martha decided to leave her job and stay at home with the kids full-time. She'd been itching to try homeschooling because she knew several people who were doing it. With Stan farming full-time and the kids at school all day, they hardly got to see each other. "Stan and I would visit families who were homeschooling, and we realized that's how we wanted our kids to act," Martha says. Her main focus is teaching the kids to read and write well and giving them a good foundation in math. The other part is teaching a strong foundation in their Catholic religion and their ability to choose between right and wrong. The older children help out the younger ones with problems when Martha's hands are full. That teamwork is a must for the Stecklers. As the kids finish eating lunch, Samantha clears the dishes while Blake begins to wash. Danielle pours the remaining rabbit gravy into a Tupperware container, scraping the bowl so she doesn't waste a drop. When she finishes, she grabs the broom and sweeps the floor. By the time their parents have finished eating, the kitchen is spotless. Sixteen-year-old Samantha says she doesn't mind the work, and they'd get bored without so much to do. Each child has special talents. Samantha, the only child with curly hair, crochets masterfully, gives her brothers haircuts and sewed the family out of a disaster this afternoon when Jeremiah woke up from his nap to find a tear in his penguin blanket. Her little brother Eli calls Danielle the "noodle- maker" because she makes them from scratch. It's a skill she could live without. "You do your schoolwork, then you do eggs, then you do noodles, and it's just not that fun," Danielle says. "It's usually only once a week," Martha reminds her. "Yeah, but still, it's noodles," Danielle persists. Martha raises an eyebrow. "You have gotten out of cleaning eggs before to package noodles," she says softly but sternly. Danielle doesn't bother with a rebuttal, knowing they all have to pull their weight around here. Stan and Martha both grew up on small, family-operated dairy farms, and it wasn't until 2005 when they moved to their current farm and switched to organic practices. Today, not only is business booming for Grass Corp, but also for organic products in general, which are responsible for more than 3 percent of the country's total food sales. Organic products have become a staple in three out of four grocery stores in the United States, not to mention the mainstay of specialty food stores, including Sunnyside Natural Foods Market in New Albany and Bloomingfoods in Bloomington. Stan says he felt pulled to a more natural way of doing things. "I thought that mankind needed to take a step back and do things the way they were meant to be done for our benefit and the benefit of society," he says. However, making the switch was a time-consuming process that took years to get right. Back in 2005, organic farming had yet to gain a mainstream following. Instead of finding a guidebook filled with tips on how to keep baby chicks warm or build a mobile coop for the pasture, Stan has had to search for the answers himself. It's been a slow and steady transition, involving a lot trial-and-error. The greatest expense in the conversion, Stan says, may be the lost opportunities during the experimental stages. The Stecklers' latest experiment, a bright green plant called barley fodder, is sprouting in the milking barn. "Green, growing feed in the off-season is the goal," Stan says as he walks me into the barn. Before I could look around, I'm smacked in the face by a thick wall of humidity. My glasses fog up, so I stick them on the top of my head and hope they won't fall off while I climb the ladder leading to the top level of the barn. This room is kept warm to accommodate the fodder. One side is lined with rows of silver-colored trays planted with barley and connected to a drip irrigation system. The plants will sprout and grow about six to eight inches tall. Stan explains that eating the fodder is similar to eating fresh grass. It's a way to combat drought and even out the food supply for the year. "It allows us to have green growing grass 365 days a year," Stan says. He hopes that cutting back on the hay the cows eat will lead to an even healthier and tastier meat. "As a farmer, you can't expect to eat fast food and have enough horsepower to run your body on a daily basis," Stan says. His son Gavin agrees. Since leaving home to attend Marion University, he says he's hungry all the time because the food isn't as good or as nutritious. The upside is that it warms Martha's heart when he scarfs down a home-cooked meal. Grass-fed meat is higher in healthy fats like Omega-3 fatty acids and is packed full of other natural vitamins and minerals, such as vitamin C, beta-carotene and vitamin E. Grass-fed meat has less fat and cholesterol and fewer calories than grain-fed meat. The quality is important, says Susan Kaempfer, manager of the New Albany Farmers Market where the Stecklers have been selling goods almost every weekend for over three years. "There's a large following for their product, and it draws a bigger crowd to our market. A lot of people just come for their product and leave," she says. Plus, she says, it's nice to see how they work together as a team. Around 2 p.m., after finishing their schoolwork, Eli and Danielle head to the market barn to wash and package eggs. It's tedious and takes almost two hours to complete. The market barn is where all the products are stored, and it has five deep freezers containing cuts of beef, whole chickens, legs of lamb, lamb chops and goat stew meat, among other things. The kids use damp cloths to wash the dirt off the eggs, then place them in foam cartons. Packaging the eggs every day helps to keep them cleaner. As they near the bottom of the bucket, Danielle and Eli start counting down. When they finish, Eli is thrilled to have 38 minutes left to play before starting his afternoon chores. He grabs a Nerf gun and runs around the house shooting foam darts at Joel and Jeremiah. Martha calls family vacations "kind of impossible" but says she and Stan or some of the kids can take turns getting away and trust that things will be taken care of at home. "We just can't all go together," she says. For fun, the family plays board games like Scrabble, Candyland and checkers or a game they invented called Trampoline Dodgeball. They never watch TV on school nights, but they occasionally turn on the tube during the weekends, favoring sports, nature shows and family-oriented movies. When the clock strikes 4, the kids put on their boots and overalls and begin afternoon chores. Eli and Danielle each grab an empty five-gallon bucket on their way to the barn, and we all duck as Garth runs up in a bright orange pair of coveralls and throws a late-season snowball in our direction. It explodes on the side of the barn as he heads off to help Joel herd up the cows. In the chicken coop, all I can see is chickens - white, brown, red - everywhere. The clucking is deafening, and the smell of fresh cow manure lingering in the air is less than pleasant. Joel feeds and waters the chickens, leading them to flock toward their troughs. Meanwhile, the kids make their way through the nests and gently pick out the brown eggs, adding them to their buckets one by one. When they finish, every bucket is filled to the brim. Blake milks the cows, and Joel waters the fodder, then feeds and waters the pigs and calves. The milking machine makes a loud suction noise as it attaches to each teat, followed by a chugging sound as the milk is drained into the tubes. By 6 p.m., the evening chores are finished, and we all head inside for dinner, stopping at the front door to kick off our dirty boots. The USDA expects demand for organic foods will continue to grow in the future. Organizations like the Midwest Organic Farmers Cooperative and the Hoosier Organic Marketing and Education group now offer assistance to organic farmers. So it's likely there's a future in organic farming, but do the Steckler children plan to be a part of it? "I just love this family staying at this farm." Everyone pulls their own weight in the Steckler family. Gavin has traded in his working boots for pens and paper and is a full-time college student whose main chore is homework. Garth, 18, is the oldest child who still lives at home and helps with whatever needs to be done, like scraping the barnyard of manure, running errands, making deliveries and herding cows into the milking barn. Samantha, 16, prepares the day's meals and helps make deliveries. Blake, 14, is in charge of milking the cows. Joel, 12, feeds and waters the animals, including taking barley fodder to the cows and hay to the sheep. Danielle, 10, is the "noodle maker" and helps wash and package eggs. Eli, 6, is responsible for gathering, washing and packaging eggs. Jeremiah Steckler, 3, goes out with Eli in the mornings to gather eggs. Otherwise, he shadows his older brothers and sisters. "Grasscorp was born as a way of getting closer to what we really want to do with the land," said Stan Steckler, who owns a 100-acre, purely natural grass-based farm located just north of Leopold in Perry County. It's a family operation with his wife, Martha, and their children, Gavin, Garth, Samantha, Blake, Joel, Danielle, Eli and Jeremiah. "We started the farm in 2001, as part of our mission to heal the land and heal people through healthy, nutrient-dense food and sustainable farming practices," said Stan Steckler. "I've always been in a farming background," said Stan. "I always have been self-employed with agriculture. I'm 42, and I started milking cows 35 years ago. Martha was brought up on a farm, too. We never really liked the chemicals used in farming, and we tried to find ways to take it back to a more natural method." The Stecklers moved from Dubois County to their current location in the rolling hills of Hoosier National Forest about eight years ago. "We were on a larger farm in St. Henry, and we'd been looking for a smaller place that we could use for more direct marketing and work with the kids," Stan said. "We wanted to set up shop and do things the way we wanted to do things, and live the lifestyle. Just when we pretty much gave up looking for the right spot, this place opened up down here." Although the Stecklers, like many local farms, are not certified organic, they do not use antibiotics or any chemicals and haven't for years. "Another focus of ours is to create a healthy environment for the animals," Stan said. "We haven't needed to use antibiotics." Grasscorp raises broiler chickens and laying chickens, turkeys, sheep, pork, beef and a few goats. Stan Steckler's brother Jerry owns a dairy herd that produces aged raw-milk white cheddar and pepper jack cheeses, which are available locally at Winestyles. "All the ruminant animals are totally grass-fed," Stan said. "We have about 45 cattle - some beef but mostly dairy - a couple hundred sheep, about a dozen heritage breed hogs, and seven dairy goats. Jerry's dairy herd is certified organic," Stan said. "The poultry is free-range, so they get to be in the pasture and forage for bugs as much as they want, and they do get some locally-grown non-GMO grain." The Stecklers do raise Thanksgiving turkeys, which can still be ordered - but move fast if you want one, because only about 20 remain unspoken for. A bigger business in the fall is broiler chickens, but these aren't the usual fat-breasted, pale-skinned broiler-fryers we're used to. "We have started raising Red Ranger chickens ," Martha said. "They're a French breed." Red Rangers are celebrated for use as a pastured chicken because they have strong legs and an active nature. The white Cornish Cross chickens usually raised for meat are bred to grow astoundingly quickly. They don't do well in a pasture environment because their breasts grow so large that they are top heavy, with weak legs. They aren't active enough to forage adequately or take full advantage of a pasture environment. "Red Rangers grow slower," Stan said. "They are put together differently from the white Cornish Cross. The Cornish Crosses are bred to be there and eat. They're like balloons; you can just watch them grow. The reds are not as heavy in the breast, and are heavier in the leg and thigh, so you get more dark meat. They stay more mobile, so they range and graze. I think these reds are more like what people envision a chicken to be." "We had a friend from the Philippines," Martha said, "and she didn't like the white Cornish Crosses at all. She wanted a chicken that was like what her grandmother used to raise back in the Philippines. When she tried some of the Red Rangers, she said they were much closer." Other fall seasonal products from Grasscorp include lots of fresh eggs and even stewing hens, older, heavier birds that are the old-fashioned best choice for soups and chicken and dumplings. "Stewing hens don't have a lot of meat on them, but they do make the best flavorful broth and stock," Martha said. If you're interested in purchasing products from Grasscorp, check the website at www.grasscorp.net first, if possible. "It shows what's available at a given time, and customers can place an order right on the website," Martha said. You can also call 812-843-3277. Deliveries are made once a week to Evansville, New Albany, Dubois County and Reo. 1 Mix the seasoned salt, paprika, black pepper and cayenne, and sprinkle liberally over the chicken pieces. Refrigerate, covered, from a few hours to overnight. 2 Dredge the chicken in the flour. In a large skillet, heat the lard or oil over medium-high heat and fry the chicken, turning occasionally, until golden brown on all sides. The lard should be about 1 inch deep when the chicken is in it. Depending on the size of your skillet, it could take more than one cup. Do not crowd the skillet. Brown the chicken in batches if necessary. 3 Remove the chicken from the pan and drain the lard into another container and reserve. Return all the browned chicken to the skillet, cover, and cook over low heat for 30 minutes or until done and tender. 4 Remove the chicken to another skillet and keep warm over medium-low heat, uncovered, while you make the milk gravy. Return enough of the original lard to the skillet to make 2 tablespoons. Add the flour and blend well with a whisk, cooking, for 1 minute. Whisk in the milk and bring to a boil, stirring constantly. Simmer for 5 minutes, stirring to lift any brown bits from the bottom of the pan. Season to taste with salt and pepper. Martha Steckler suggests serving the chicken and gravy with mashed potatoes. 1 Rinse chicken, pat dry, and season to taste with salt and pepper. Heat oil and 2 tablespoons of the butter in a large skillet over medium high heat. Working in batches, add chicken and brown on all sides, turning, for about 15 minutes. Remove pieces as done and set aside. When all of the chicken has browned, pour off most of the fat from the skillet, leaving just enough to thinly coat it. 2 Reduce heat to medium add garlic and shallots, and cook, stirring frequently, until slightly soft, about 5 minutes. Deglaze skillet with vinegar and wine, add honey and scrape browned bits of bottom with a wooden spoon. Reduce by about one third, for 3-5 minutes, then stir in tomato paste. Return chicken to the skillet, pour in the stock, and simmer for 10 - 15 minutes. Turn chicken and continue cooking until juices run clear, about 15 minutes. 3 Remove chicken from skillet and set aside. Increase heat to medium high, and continue cooking until sauce is thick and glossy, about 5 minutes. Cut remaining 4 tablespoons butter into small pieces. Remove skillet from the heat and whisk butter into sauce. Adjust seasonings. Return chicken to skillet, turning to coat evenly with the sauce and serve, sprinkled with parsley. 1 Dry the pieces of chicken thoroughly and sprinkle with lemon juice, thyme, salt and pepper. Set aside. 2 Heat the olive oil in a large heavy-bottomed pan. Add the salt pork and chicken. Saute for 15 minutes, turning the pieces on all sides with tongs. Remove the pork and chicken from the pan and add the onions, adding more oil if necessary. Cook over a low flame for 10 minutes. Add the garlic cloves, tomatoes, bay leaves, and wine and cook for 10 minutes. return the salt pork and chicken to the pan and cook slowly, uncovered, for 35 - 40 minutes, basting frequently. Check seasoning. 3 Five minutes before serving, remove the bay leaves and garlic and add the olives. Sprinkle with the parsley or basil and serve at once.